The key performance indicators of a company include quantitative measures that use an instrument for measuring the performance of the company. This performance indicator is used to identify the contribution of operational activities for attaining objectives and vision. Specifically, the key financial performance evaluates financial elements of a company for making a comparison with other competitors in the industry. Key performance indicators are essential for attaining success in an architectural business. There are many firms operating in the architecture sector. In this aspect, the focus of most of the medium firms emphasizes on reducing the cost of the business. Through evaluation of financial performance indicators, businesses compare their standings with other similar businesses. The business maintains all financial records through practices of bookkeeping to record the financial aspect. Analysis of key financial performance indicators by the architect helps to identify the quality of operations and its overall impact on business performance. Financial performance indicators are divided into a different form based on the nature of the business. The main financial KPI’s for an architectural engineering firm are presented below. The important element of an architect’s business is to identify utilization rate. This includes the proportion of time that is spent on development of different projects with an actual number of hours worked. This reflects the relation of direct labor and total hours worked. This financial performance includes the time that is provided by the client for completion of a specific project within a specified time. This does not measure overall productivity, which is difficult for architectural firms. Moreover, utilization rate neither specifies the level of profitability through maintaining an optimal rate the enhance the profit potential. The financial key performance indicator of utilization rate measures overall efficiency and effectiveness with efficient utilization of primary utilization in the business. The ideal range of utilization ratio is for the company to attain 60-65 % for the professional and technical staff of an architecture firm. Overhead Rate is the ratio of indirect expenses to the direct labor costs of a company. This is an important financial performance indicator for identifying profit and loss based on development of appropriate rates. This is made by comparison of the company’s actual and projected financial performance that includes non-projected costs. This is a complicated aspect in comparison to other financial indicators. It is not possible to measure the actual rate for overhead in an architectural firm to identify expected returns. In this aspect, lower overhead rates result in higher profit margins. Generally, architecture firms tend to maintain a rate between 150-175% of direct labor. This rate can be maintained through controlling overhead rate. An increase in this rate requires the business to take appropriate action. The break even rate is varied across different employees with certain costs. This rate represents the actual cost that is incurred by each employee of the company. It is measured in architecture firms on the basis of actual overhead rate and employee salary per hour. This rate is measured on the basis of actual work that is done by the employee with utilization of different resources. This makes a comparison of actual labor costs per hour, an employee’s salary, and their working hours. Net multiplier is the comparison of net operating revenue with direct labor costs. 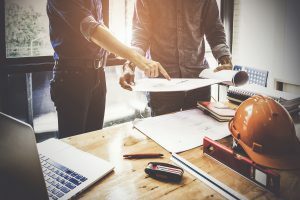 If the architecture firm considers the direct labor as capital investment, this means that the net multiplier is presenting the return on investment. This rate identifies the amount of a company’s earnings from spending on direct labor. If the result of the net multiplier is greater than the break even rate, the company is earning profits or vice versa. Profit maximization is the aim of every business. This ratio measures the amount that is left after all spending. This ratio measures the effectiveness of architecture for completing different projects. The higher ratio reflecting greater profits of the business at the end of completing the project. This ratio measures the net earnings with operating revenue that identify the efficiency of the firm for performing different activities.